Your 1-Stop Shop for Inflatable Tunnels, Inflatable Tunnels for Football, CO2 Fog Effects, Train Horns, Field Runner Flags and T-Shirt Cannons! DeadBall Entertainment has been in the inflatable tunnel and inflatable football tunnel sales game since 2011. We specialize in selling inflatable tunnels to the High School and the Youth Sports market. 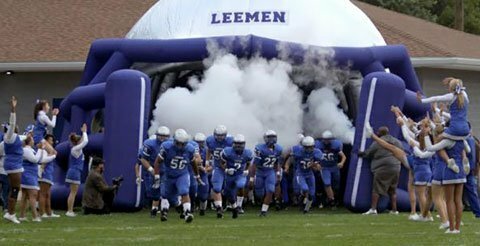 We have sold inflatable tunnels for all sports and inflatable football tunnels to the Collegiate level, but we understand how tight funds can be in the High School market and work hard to make an inflatable tunnel for football a goal that can be reached. We sell inflatable tunnels and inflatable football tunnels all over the United States, and have even had a few inflatable tunnels sold outside of the USA! We have achieved an A+ rating with the Better Business Bureau. In the many years of our inflatable football tunnel sales, we have never had a complaint about our products or our workmanship. In addition to inflatable tunnels, we also build and sell our very own CO2 Fog Jets, the same effect used in the NFL and many college team introductions. Even if you don't have an inflatable tunnel for your football team, the CO2 Fog looks great by itself! We have everything you would need to keep your sports fans entertained during a game. Besides inflatable football tunnels, we also sell some of the best T-shirt guns in the country...field runner flags for your cheer squads...and a hand-held CO2 operated train horn for your entrance through your inflatable tunnel or when you score a touchdown! The idea for inflatable tunnels wasn't the original idea for DeadBall Entertainment. We started as a company called CO24You, and specialized in cost effective CO2 Fog effects for football teams. It wasn't until a customer who bought a set of our CO2 Fog Jets, a t-shirt cannon and a train horn, asked if we sold the inflatable football tunnels like he had seen on TV. After some research, we determined that selling inflatable tunnels for football was an option...and DeadBall Entertainment was born. Since becoming DeadBall Entertainment, we have sold hundreds of inflatable tunnels for football and other sports. Inflatable tunnels just aren't for football anymore! I have sold inflatable tunnels for soccer, basketball, volleyball and softball! We strive to give a great customer experience, and we have had many former customers return to DeadBall to purchase a new inflatable tunnel...trust in us is our #1 goal! We want to be your "one stop shop" for all of your DeadBall Entertainment needs! One place for inflatable tunnels, t-shirt cannons, CO2 Fog Effects, train horns, and even confetti and streamer effects. Please call us at 321-624-4869 if you would like to learn how we can help!